Happy Sunday loves. So thrilled to have some much needed quiet time to get some writing done. All of my thoughts crowd my brain and it feels good to get them out and create space in there. I have been connecting with some fashion bloggers in my current home town and the common question I have been getting is "Is it so hard having a lifestyle blog with 6 main categories" This really made me think. In some ways it is challenging because you never really want to "neglect" a category. You want all of the content in each category of the blog to shine but then you find some weeks you were definitely more focused on clean eating so your recipes were really soaring but you were not really doing a lot in terms of styling clothes and zero time was spent on traveling. On the flip side though you have a lot more content to share then just fashion. My life is super busy and if I were to show you my daily #ootd's, well they would be repeats or yoga pants or nothing interesting really. And I am currently incredibly passionate about so much more then just fashion and styling right now. So perfect example of this amazing virtual interview I had with the amazing Sara Lytle and trying to figure out what category this story would best shine in because It could definitely be a Santa Barbara travel guide. But it could also live nicely under entertainment, Sam's stories, and wear. I toyed with this for probably a good hour and the question that lingered in my brain was what if style is much more than just our clothes? Yeah, sure, ok. We all know that. Obviously style is much more than our clothes. It’s how you wear them, how you move, it’s about being present. But maybe it’s also about the way you live your life. It's definitely about the way you live your life. Why am I even asking this?! It’s putting together a beautiful birthday dinner. Cultivating your passions. Knowing how to pick out flowers and put them together. Creating beautiful friendships. Writing a letter. Being fulfilled in your work. Knowing how to travel. I feel so lucky to decide how I want to live my life and what kinds of people I want to be around in this next phase. I just cleaned out my Facebook account deleting 154 people and that felt tremendous. These people were not serving any purpose there. They were just taking up space. I am learning so much from my blog and evolving with it really, which is the funnest part. It all made sense. This Sara Lytle interview would fit perfectly in my wear category, which I am now changing to a style category. This makes more sense to me and gives my writing more freedom. And Sara's life, her art, her Santa Barbara studio.... her story...it all exudes the best kind of style and I am thrilled for you to get to know her!! Lytle's abstract mixed media work is ignited by a fascination with auras, chakras, universal energies, and what she likes to call the “magic of crows.” Soul exploration, metaphors, and worlds beyond are ongoing concentrations. Born in the 1950’s, in southern Arkansas, Sara spent her childhood years in Texas and Oklahoma; graduating from Kansas University with a BFA/Design in 1974. Her work is found in corporate and residential collections internationally, including the private collection of Mr & Mrs Joe Cocker, and the corporate collection of Horny Toad. Lytle works out of her studio, on the Santa Barbara Riviera. And I am sooooo incredibly inspired by her. The way she lives and works seems really dreamy to me. Organizing a life that fits you and having zero regrets is what I am craving! Take a break from Orange Is The New Black (I am finding it to be such a boring season anyhow) and grab a mimosa and come on a West Coast art adventure with me! -What are you presently inspired by? - What mediums do you work with? Primarily, mixed media on canvas. -How would you describe your subject matter? I paint abstractly; from what I feel, rather than from what I see. -What themes seem to occur/reoccur in your work? I’m extremely grateful (lucky!) to have a dedicated home studio. I’m easily distracted, so a space that’s “mine” is a luxury. I have a brief ceremony before diving into the painting process….a meditative time with sound bowls, sage, music, and quiet. Ozzie, Harriet and Bob, our three crazy dogs, love studio time too. -What are your biggest challenges to creating art and how do you deal with them? Finding uninterrupted studio time can be a challenge. Later….gaining visibility for work, thinking big, marketing, and getting press are all tasks to be tackled. -How do you navigate the art world? Navigate? Ha! Until recently, I’ve sort of waded through. 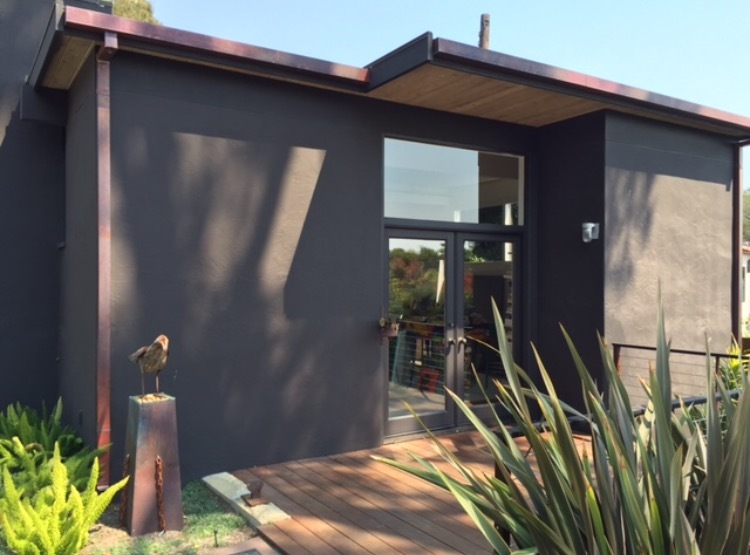 Although, in May 2016 an artist friend (Lynn Cunningham Brown, “encruster of dead things”) and I took a flying leap, and opened an art space/gallery in Santa Barbara. “Abolish Blandness.” Since that jump, we show our work 24/7, as well as the work of other artists. - Do you see your work as relating to any current movement or direction in visual art or culture? Nah. I just do my thing. -Which other artists might your work be in conversation with? Haven’t a clue…..but would love it to be Basquiat. -Do you have a motto? - Are you involved in any upcoming shows or events? Where and when? Yes. I am co-proprietress of Abolish Blandness, an “art lab/gallery in Santa Barbara. We curate monthly shows of our work and the work of other artists, with openings every first Thursday and first Friday. Additionally, I participate in shows nationally. - When people ask you what you “do”, how do you answer? - What are you currently reading, listening to or looking at to fuel your work? Edgar Cayce. Kitaro. Sacred Spirit. - Has there been a shift or change in your life or work that has led to what you’re making now? After being diagnosed with rheumatoid arthritis, nearly a decade ago, I returned to painting. The lovely symptoms of RA put an end to my stint in the fashion biz (one of a kind hand-crocheted sweaters); my hands could no longer handle such repetitive action. Always needing a creative outlet, I dove back into the paints. -Do you see your work as autobiographical at all? Ummmm, subconsciously,maybe, but, really more metaphorical. -What are you most proud of? I’m tickled pink to have shown my handmade fiber work in New York and Paris fashion weeks; thrilled to show my paintings in exciting galleries nationally; and honored to have my work placed in both residential and corporate collections here and abroad. -What do you want your work to do? -Your also created sweaters for a period of time. Tell me about this? And do you see yourself doing this again? The “Sara Lytle” (catchy name eh?) line of sweaters existed for several years, selling in luxury boutiques in the US and Canada. That was big fun! Loved it. Loved the talented artists that worked with me. As mentioned, this excitement ceased when RA entered my world. 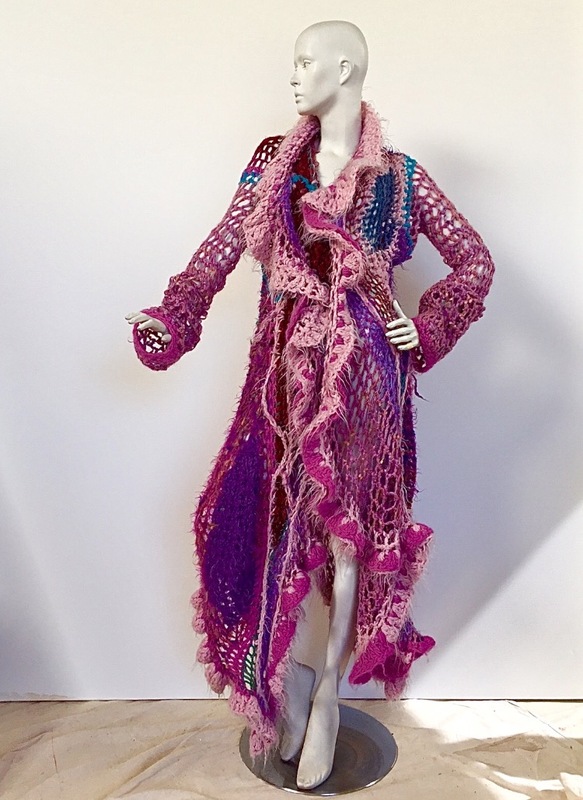 I still love to crochet, love crazy fun yarns, love fashion. It’s now a hobby rather than a profession. Crochet hooks ask more of my hands than painting does. Have I mentioned that most of my painting is “finger painting?” You know, like we did in kindergarten? -Your fave thing in your closet right now? - Oldest thing in your closet? Road trips. International travel. Crochet. - Advice to the young aspiring artist? - Advice to the person wanting to just get up and move to California...? Have your ducks in a row, living here is a pricey meatball. Brophy Bros. for oyster shooters. Lotusland. SBCAST/Abolish Blandness gallery. Funk Zone for many, many other galleries. State Street for shopping and hipsters. SB Museum of Art. San Ysidro Ranch, go for dinner and an old fashioned at Stonehouse under the main dining room. Beach walks. Channel Cat, watch for whales and sunsets. Hiking. Sunsets, even without the Channel Cat. Wineries. Postpone the Monday departure, stay longer. - Intrigued with your annual Thanksgiving event? How many people attend and how does it all go down? My beloved Fred & I have hosted this soiree since moving to Santa Barbara from Tulsa almost 30 years ago. It started small, just for people who had nowhere else to go that day. Now we have more than 80 guests seated at one long table stretching across our upper lawn. Jim & Kim, dear friends from Tulsa, attend annually and (thank heavens!) come early in the week and help us prepare the traditional feast, primarily using my NaNa’s recipes bolstered by 4 turkeys grilled/smoked by Fred and Jim. YUM! Corks begin to pop early afternoon. We dine al fresco around 3PM. The grand finale is an array of “Molly’s pumpkin chiffon pies” (a family recipe Molly, Jim’s sister, stubbornly will not divulge). Grand-daughter off to University of Oregon in the fall! Uh-mazing, right?! I am now needing to get to Santa Barbara asap and experience all of this, including The Thanksgiving feast. Maybe I can earn my way by tempting Sara with my famous cranberry stuffing. Ha.If you ever visit Santa Barbara go pay her a visit. And seriously you loves..what inspires you? What do you dream of doing? And what's holding you back? Life is short. Let's all go chase our dreams!